Larry “L J” was born in Greenville, Alabama. He graduated from Troy University with a Bachelor of Science in Business Administration and Marketing. After graduation from Troy University, he served in a Sales Position for R. J. Reynolds. He was promoted to Assistant Division Manager in 1977 and moved to Montgomery. 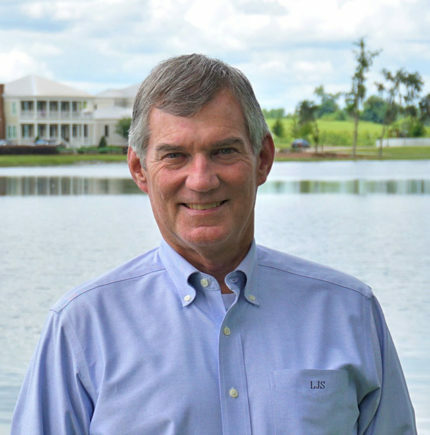 He supervised 10 Sales Representatives covering central and South Alabama. In 2001, he received the Bowman Gray Sales Award. He has over 30 years of sales experience. He enlisted in the Alabama Army National Guard in 1969 and served 6 years enlisted. He then attended Alabama Military Academy receiving his commission in 1977. He served in several positions across the State and in 1989 took command of the 1208 Quartermaster Company in Lineville, AL. In 1990 his unit was activated to serve in the Middle East. He served 10 months in Saudi Arabia during Desert Storm. After returning from Desert Storm, he attended and graduated from Command and General Staff College. He then served as an instructor for Command and General Staff College achieving the rank of Lieutenant Colonel and retired in 2009. He became an entrepreneur and small business owner by opening and operating ICBY Yogurt in Montgomery for 5 years. For the last 8 years, he has been involved in the Mortgage business working as a Certified Signing Agent. He has extensive knowledge in handling loan documents for refinancing, purchasing and selling property. He serves on the Montgomery Chapter Troy University alumni board which provides scholarships for students to attend Troy University. He actively belongs to Young Meadows Presbyterian Church and has been involved in Child Evangelism Fellowship. He has a passion for sports and officiates High School Basketball and Football. He is married to his high school sweetheart Yvonne, and they have 2 children and 4 grandchildren. They reside at The Waters in Pike Road – Their “Pike Road Paradise”. Call ‘L J’ anytime without obligation. He is ready to go to work for you today! Other than family, returning from Operation Desert Storm having achieved our objective. Keeping Yvonne happy! Happy wife, happy life!